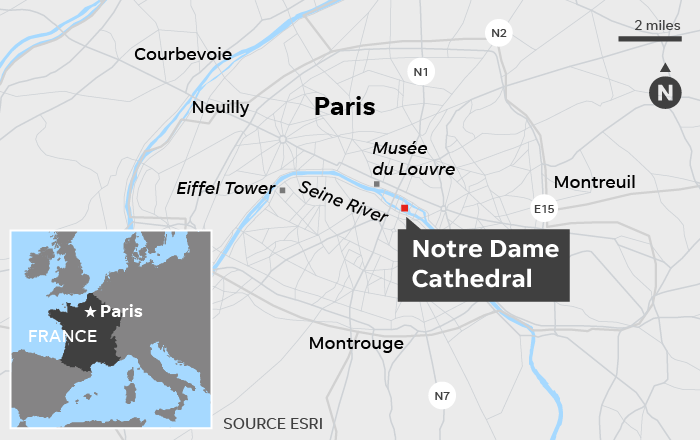 PARIS – A massive fire was raging Monday at the famed Notre Dame cathedral in Paris as shocked crowds gathered on streets, bridges and squares to watch one of the globe’s most iconic churches burn. There was no immediate word on injuries. Many tourists and others in the area tapped social media to notify friends and relatives that they were not harmed. Firefighters blasted the inferno with water from a ladder trucks but did not tackle from above. Some could be seen laboring inside the structure itself. A perimeter kept back at least a perimeter of three blocks. Still, the cathedral is widely considered one of the finest examples of French Gothic architecture in the world. The name Notre Dame means “Our Lady” in French, and is frequently used in the names of Catholic church buildings around the world.